I also sorted through a box last night, which was a major trip down memory lane – first wedding photos, baby pictures, etc. Then I came across a letter from a friend who died in his early 30s. He was a gentle spirit and beautiful artist. He wrote the letter right before his 25th birthday and talked about his depression and agoraphobia. He hadn’t left his house in weeks. Instead of becoming too melancholy about the letter and losing him too soon, I focused on the part where he thanked me for all the letters I sent him without getting a reply, which eventually inspired him to write back. I couldn’t fix his depression, but he always knew I was thinking about him, so I guess that’s something. My other big takeaway is that I need to get back to pen and paper now that I’m in Texas. The letters I thumbed through last night have traveled with me for 20+ years. No email or blog comment will do that. I have a “box full of letters” (cue Wilco) post coming down the line. That’s a tough one. Do I keep it or let it go? That’s certainly not an easy call to make, at least, not for me. Oh Eric, I feel your pain. We had a huge file cabinet in our bedroom that had years and years and years worth of stuff in there. 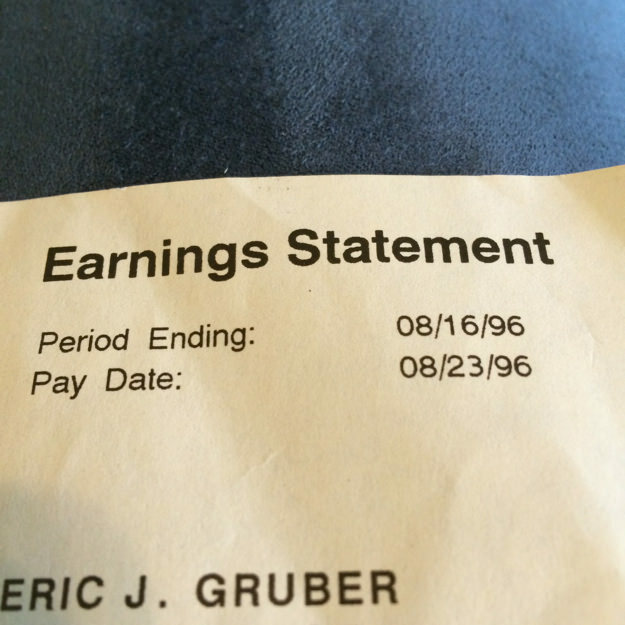 I found a pay stub from college when I did work study…15 years ago. David found his very first pay stub from the army that is 19 years old. And we too have a lot more work ahead of us. One box, one pay stub, one old letter at a time…it’s crazy how much stuff we hold on to.